1. Check and make sure that power are connected firmly, clear CMOS. 2. Check your other major hardware’s (memory, video card, CPU and power supply) to ensure that they are not the cause of the issue. 3. Isolate board outside of the case on a non-conductive surface to check. 4. If you need further assistant, please feel free to contact our technical support department directly at 626.271.1004 from M to F, 6am to 6pm Pacific standard Time. Pros: - Small wifi antennas that are on the IO shield, not auxiliary like most other mini mobos. - It looks beautiful, and will fit with any color scheme except myabe white. - I'm using a haswell pentium dual core, but this can take the i7 if I want to upgrade in the future. - Has front panel USB 3.0 headers. -The IO shield is actually labeled and coated with a black sticker, not just a straight metal one like on cheaper board. -UEFI displays in full 1080 not 1024 like some other boards, so it's more usable on my wide screen monitors. Other Thoughts: I've installed Win 10 tech preview on it, and nothing is having trouble running. 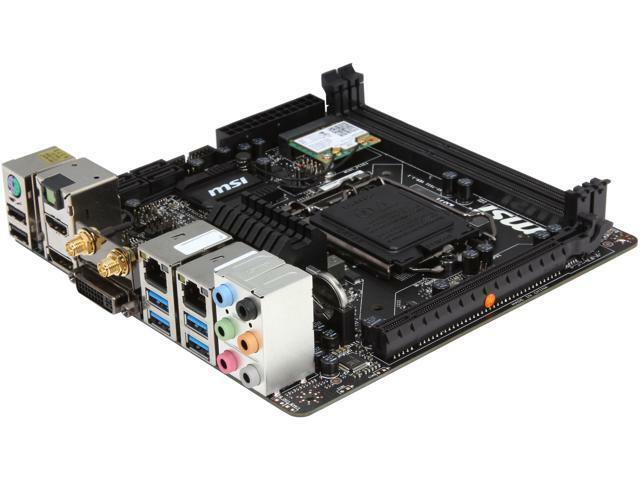 The z87 chipset isn't the newest, but it still supports haswell processors with a bios update. My board came with the bios update out of the box though, so I was just plug and play. I also got a free DIM of 8gb DDR3 ram with this board, so for $70 off the price of the board normally, I couldn't day no. I don't know if others are having an issue with dual video output. I have a TV connected to the HDMI and monitor connected via DVI. However to get this setup to work, i had to plug in my monitor to HDMI first then plug it into DVI to get HDMI output to my tv. If i reboot, with the TV on HDMI, there is ONLY output to the monitor over DVI. Based on the symptom you reported since many reasons can cause the situation like this, please do not hesitate to contact us directly by email at usreview@msi.com or by phone at 626.271.1004 M-F, 6AM to 6PM PST. We will be more than happy to assist you. sadly i got 1.5 version so i had to update bios but that wasnt big problem to me. Pros: Now works like it should! Dual monitor support with onboard graphics. Lots of features in a small package. Cons: Had to update the BIOS. Not a big deal to do but it's not real clear on what "type" of update you need. Other Thoughts: Below I left a very poor review. I'm now updating my review to 4/5 stars. The problem that I was having and likely others is that out of the box it does not reboot or shutdown with a Haswell CPU. To fix this, you need to update the BIOS but do so with the "ME" option. This will fix the issue. Previously I tried a "normal" update. Very happy with the board now. Pros: Great little board, got it as part of that combo deal. Cons: Had the same problem as the other reviewers. The board will not shut down or restart on its own. Think it's a haswell refresh issue. However a bios update fixed it for me. Cons: Dear MSI -- please update the bios and fix your BIOS / firmware issues! Don't lose customers over a shutdown / restart issue..
Other Thoughts: Mine DOES shutdown. I reinstalled Windows 7 and it now shuts down. It still doesn't restart -- just hangs there. Installed BIOS v1.8. If MSI doesn't fix this restart issue, I'll never purchase MSI a again. Cons: I was duped by the good combo deal as well but now have the same problem as everyone else. Went through all the troubleshooting steps. System won't reset. Brand new everything, using onobard video. Nothing extra. Updated to latest BIOS 1.8. Commanding the system RESTART never works. Just goes a black screen where you have to hold the button to get it to shut off then press it again to get it to turn back on. Doesn't work from Ubuntu GUI or terminal. Doesn't even work from the BIOS. Big disappointment. Judging by the reviews, this problem isn't a rare occurance. Last time I'll buy MSI anything. Avoid, avoid, avoid. 1. Check and make sure that power are connected correctly and firmly (JPWR1 and JPRW2). 3. If you need further assistant, please feel free to contact our technical support department directly at 626.271.1004 from M to F, 6am to 6pm Pacific standard Time.